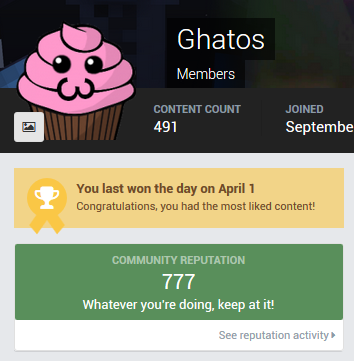 Ghatos had the most liked content! 825 Slow down, you're gonna break the up-rep button! So logically, I'm very lucky now! Congrats, now every times you'll get a upvote you'll get downvote too. THEY WON'T GET YOU MORE THAN 777!